Learn about Las Vegas’ brewpub scene and taste different types of craft beer on these guided afternoon and evening brewery tours. Get an inside look at how beer is made, and chat with brewery owners about their operations. 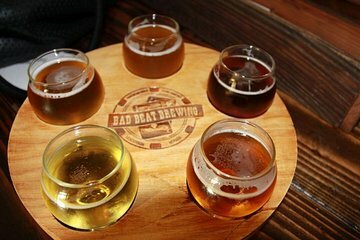 Visit three breweries that may include Bad Beat Brewing, Boulder Dam Brewing, CraftHaus Brewery or others. Round-trip transportation by motor coach in Las Vegas is included. Our last night in Vegas was so much more memorable by our host Steve and the rest of the crew at Sin City Brew Tours. Friendly, knowledgeable brewers and a great tour guide made this a great retirement celebration for me and a great birthday party for my wife and daughter. Excellent tour would definately recommend, tour guide went above and beyond! Prepare yourself for a hangover the next day!! Die Tour war sehr gut organisiert. Wir haben 3 Brauereien besichtigt und viele Biere probieren können.